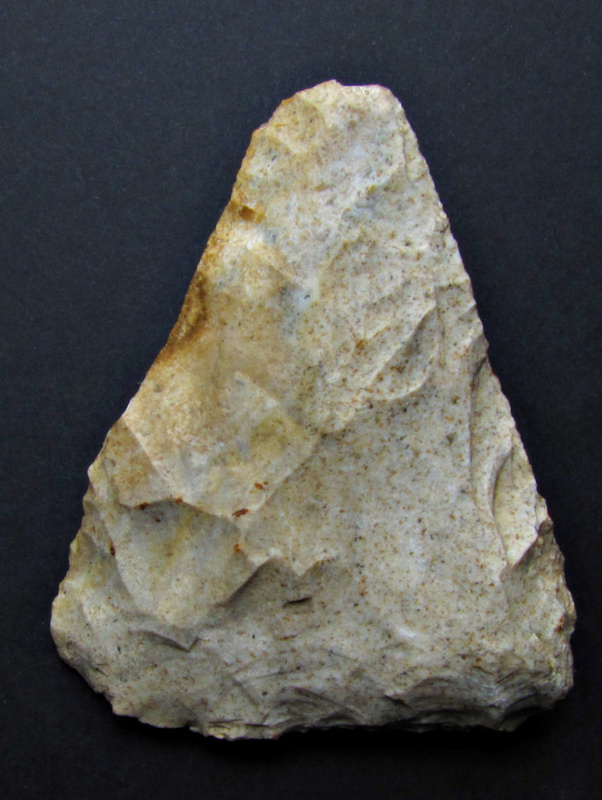 Figure 1 shows a rare 12 cm long (sub) triangular handaxe from the Dordogne in S/W-France. There are almost no signs of use or resharpening on this artifact. Such bifaces do not belong to the sphere of the common gear but to a class of very special artifacts. They are the most geometrized artifacts during the European Mousterian with blurred boundaries to the more common cordiform variants (see here 1350 , 1521 , 1288 , 1534 and 1077 ). 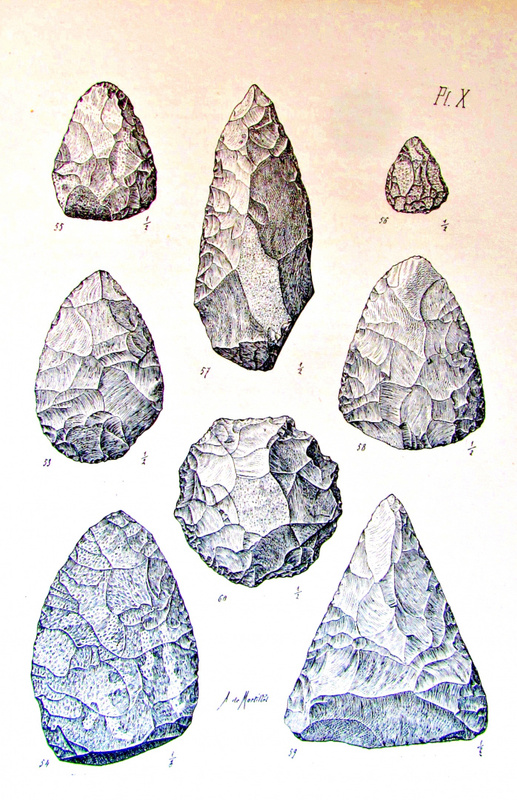 The founders of Prehistory intuitively noticed such features and it is not by chance that a very early depiction of a triangular Handaxe comes from the 1881 edition of the “Musée préhistorique” (Gabriel and Adrien de Mortillet; Figure 2). Triangular Bifaces are characterized by three possible usable margins and are known from the Mousterian in N-France during OIS5a and 3 and from the classic MTA of SW-France during OIS3. Further findings in France are known from other areas (for example from the Charente, Vienne and Corrèze). Even in Northern Hessen and NRW / Germany some examples are known. Most triangular handaxes are Plano- or biconvex and are made of larger flakes by hard and soft hammer technique. 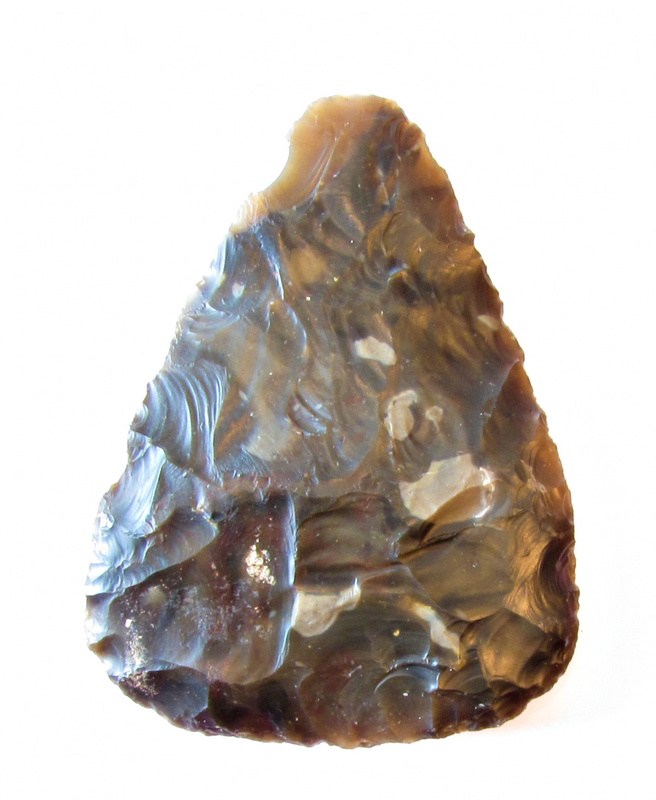 The initial diversity of bifacial tools is connected primarily to the accessibility, abundance, and diverse properties of the lithic raw materials employed, as well as the form of the volumes transformed. 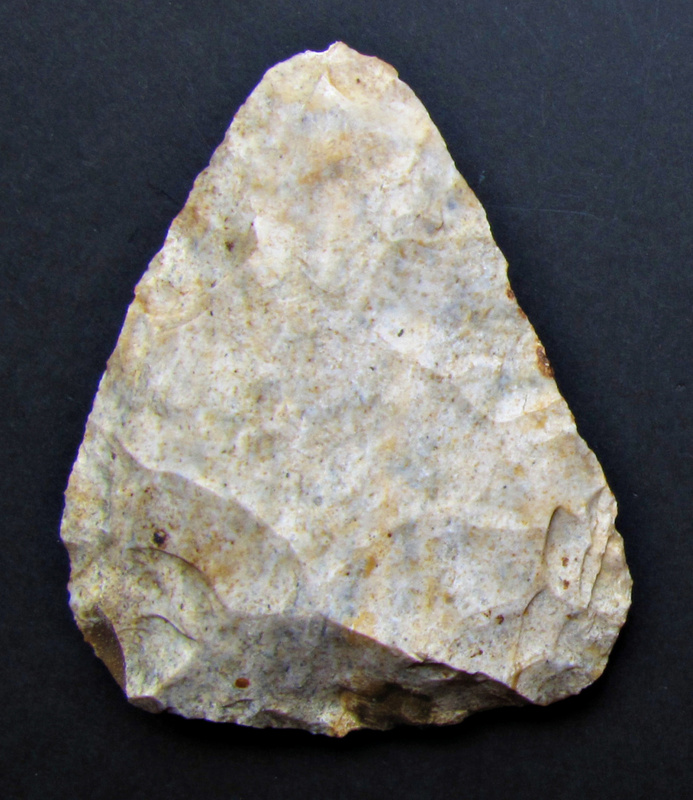 In France, particular raw materials, both in terms of their abundance and flaking quality, were preferred for biface production, such as Maastrichtian flint available for example in the Bergerac region or the exploitation of fine-grained Upper-Turonian Flint in the area of Touraine. Fig. 3 shows a stray find from the Loiret. An extremly thin example (3 mm thickness made from a very homogeneous flint). Raw materials for biface production during the Mousterian were sometimes transported over long distances, as demonstrated by bifaces in Turonian flint manufactured in anticipation of future needs and transported at least twenty kilometers to the south to Chez Pinaud or La Chauverie in the Charente, or those made from Flysch flint, transported more than 70 km to the north-east to Latrote in the Landes region. At Le Moustier and Pech de l'Aze I , this circulation of bifaces made from nonlocal raw materials is evident in the presence of bifacial thinning flakes in Bergeracois flint from sources found at least 35 km from the site. On the other hand triangular bifaces were also produced at the raw material outcrops; therefore an "exotic" origin was not a precondition for their production as shown in Fig. 4. and 5. These figures displays two triangular handaxes made from a local flint, found at Coussay Les Bois, Dept. Vienne, France. They are the only triangular among dozens of cordiforms at this site with workshop character. A similar pattern can be observed at the famous Fontmaure site. 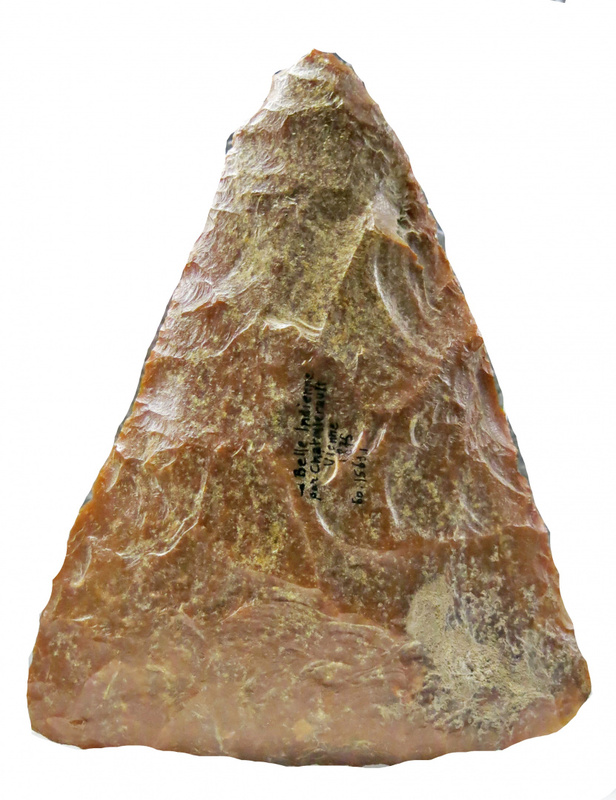 Many Mousterian bifaces, including the simplest ones, are common tools that were often used, resharpened and reduced. It remains unclear if these modifications were done by the same person, or if the artifact passed from person to person until they were finally exhausted and abandoned. Regarding ethnological examples their use as "collective tools" seems to be most probable. Such “domestic tools” in the same sense as most of the common flake tools, were manufactured and used for frequent tasks and share a technical longevity limited in time and space. The social scenario could be different for the very carefully made triangular bifaces, which are much more less frequent in assemblages. These pieces demonstrate certain individuals to possess technical knowledge and skills that distinguished them from the rest of the group. This tools were rarely used for domestic purposes and rarely show any signs of resharping and recycling. They stand out against the more frequently shaped tools both in terms of their technical and “aesthetic” qualities, including their regularity and axial symmetry. Here we argue that such MTA-bifaces are truly special among the common. 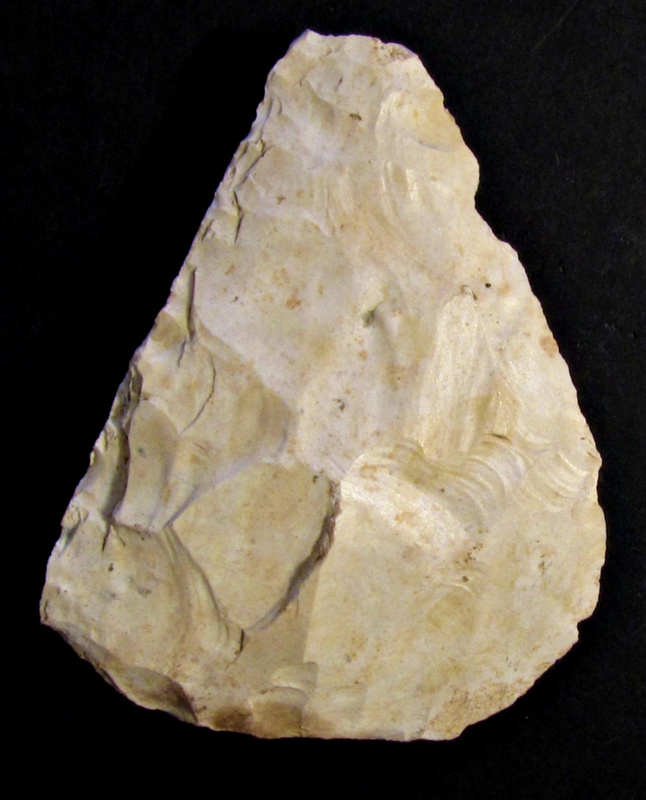 The last Figure shows one of the most famous triangular bifaces of France, which was found in the Vienne near Châtellerault ("La belle Indienne") in 1871, now housed and displayed in the Musée d'Aquitaine à Bordeaux (Photo: Don Hitchcock 2015). Other good examples are known from the MIS3 site of Saint-Amand-les-Eaux. Here Dozens of flint knapping stations have been identified on the ground by the concentrations of flint flakes related to tool production. Geometric forms and high technical skills are contested by the sixty bifaces thus far discovered, among them very finely made triangular bifaces.